Just before my older son turned three, he tried a bite of my husband's and my pad thai, and we watched him go into anaphylaxis. Sitting in his booster seat at our dining room table, he stopped speaking, drool pooling inside his mouth and trickling down his chin because his throat was swelling. We called 911 and soon learned he had a life-threatening peanut allergy. The allergists we consulted told us to shut down our world and slowly rebuild it, meaning that we had to avoid restaurants and any kind of food gatherings until we researched safe options and educated our friends and family. We later learned that our younger son also had life-threatening food allergies. How would we keep our sons safe and yet still give them the lives of carefree playing and easy socializing that we'd envisioned? Later, I saw on one of my older son's appointment summaries that the allergist had noted that the mother was "terrified." He was right. 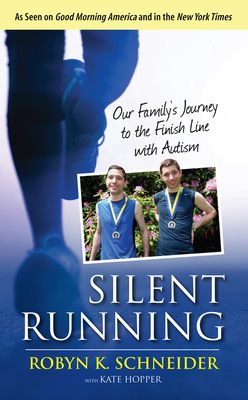 Robyn K. Schneider's memoir, Silent Running: Our Family's Journey to the Finish Line with Autism, shows that as mothers, we can handle almost anything—including conditions that initially seem to threaten what we want for our children. In her book, Schneider reflects on being a mother of twin boys, both of whom had significant symptoms of autism. For this project, Schneider collaborated with author and former Literary Mama editor Kate Hopper to write her story. The book brings readers into Schneider's world as she grapples with feelings of both loss and determination in her quest to meet and ultimately accept her sons' needs. And although my own boys have faced different challenges with their bodies and with their learning—such as food allergies and ADHD—I was quickly pulled into Schneider's dramatic story about learning how best to raise twins on the autism spectrum and found myself particularly moved by her reflections on hope, loss, and perseverance that are universal to so many aspects of parenting. When Schneider's twins Alex ("Alie") and Jamie were toddlers, she and her husband Allan noticed changes in their development. The boys stopped responding to their parents, pointing to things, or even acquiring new words. Instead, they engaged in repetitive behaviors. At 17 months old, Jamie spoke only one word, and Alie didn't say any at all. Schneider writes, "But it wasn't just their lack of speech that began to worry Allan and me; they seemed to have changed. They no longer ran to us when we called their names, they no longer made eye contact, and sometimes they seemed distressed for no reason at all." When the boys were 21 months old, a neurologist diagnosed them both as having "language delay with autistic characteristics." This diagnosis came during the early 1990s, before "autism" was a household word and, thus, before Schneider and her spouse had access to an online network of other parents with autistic children or much information from books or websites about raising autistic children. The twins required an extensive array of early intervention services, including working with special education teachers and speech and occupational therapists. Not only did Schneider and Allan face the challenges of learning to work with such specialists in the best attempt to support their sons' needs, but Schneider was also determined to find a cure, holding fast to the idea of the future she'd envisioned for her sons—a future consisting of mainstream education, friendships, marriage, and careers. Over the years, my husband and I have learned how to navigate safe, joyful lives with two boys who have life-threatening food allergies. We, too, have worked through feelings of loss, acceptance, and resilience. Schneider journeys through similar emotions and her writing intimately invites readers into her world in a voice that is both accessible and authentic. For instance, exploring her struggle to accept the original diagnosis, Schneider reflects, "[P]art of me still felt I was somehow responsible for their autism, that somehow it was my fault. And in order to alleviate my guilt, to keep it from engulfing me, I kept pushing, kept searching for a cure." Over time, the Schneiders built a supportive community of professionals and friends. When their boys were three-and-a-half, the couple hired staff for an intensive home-based applied behavior analysis (ABA) program. As Schneider explains, "ABA took over our home—we ate, slept, and lived it. I became accustomed to the sing-song praise, the repetition, the reams of data sheets we used to record each of the skills we were teaching Jamie and Alie." The boys acquired skills that enabled them to learn and to interact with others, but overseeing a full-time homeschool program was difficult emotionally as well as financially. When the boys turned five, the Schneiders worked with other parents to launch a satellite school exclusively for children with autism. Although her boys' interventions changed through their early years, Schneider describes how her family settled into new routines after their initial diagnosis: "Our lives fell into a kind of rhythm after that first assessment—if it's possible to find rhythm in the chaos of navigating work and research and the boys' many therapy appointments; if it's possible that one can discover an unexpected cadence by stringing together the notes of confusion and heartbreak with dogged determination." By the time Alie and Jamie were five-and-a-half, Schneider and Allan had found that while they could serve the twins' physical and cognitive needs, it was becoming clear that the boys faced other neurological issues that complicated their learning. Both boys remained nonverbal and had significant obsessive-compulsive behaviors, high levels of anxiety, and intellectual disabilities. With the level of support the boys needed, they would never live independently. Schneider's most significant transformation in the book comes when she embraces the idea that, despite all of their limitations, her twins could still lead full, happy lives. As she writes, "There had already occurred in me a subtle shift, a slight turning away from focusing on their cure and recovery to focusing on their happiness. How, if they would never recover from autism, could I ensure that their lives would be full of joy?" When the boys turned 15, a friend suggested that Schneider and Allan bring them to a group run with the Rolling Thunder Special Needs Program—a running group for children and adolescents with special needs. Supported by coaches, participants train alongside peers and take part in mainstream races. Schneider and Allan hoped running could help with the boys' excess energy and anxiety, but worried whether the boys could run safely. Coaches would need to manage Alie and Jamie's behavior continually, running alongside them to ensure they didn't wander off or hurt themselves. From that first run, however, it was clear that running brought Alie and Jamie joy. Running gave the boys another identity and helped their parents see beyond the boys' diagnoses. On a physiological level, running provided a powerful release. On the days they ran, Alie and Jamie seemed less agitated. Rolling Thunder also provided Schneider and Allan with a community of special needs parents focused around creating fun experiences for their children—something the Schneiders had not had before. When Jamie started showing increasing signs of agitation on his runs, pulling on his coach's arm and making loud sounds, Allan decided that despite his own multiple sclerosis, he would learn to run with his son. By this time, both boys had grown attached to the running routine and competed in mainstream races with their coaches. The need for Jamie's safety provided motivation for Allan to run with him, but there was also a deeper reason. Running provided a way for Allan to bond with his son. As Schneider puts it, "I knew [the twins] loved us and felt safe with us, so I never felt I had to mourn that special mother-child connection. We were connected. But I realized how much we still missed out on and, later, what Allan specifically missed out on: he would never be able to teach Alie or Jamie to drive; he would never be able to talk to them about girlfriends, college, politics, or his own childhood. . . . What he could do was share something else with Jamie; he could run with him. So despite the setbacks he faced on the trails because of his MS, Allan kept at it." As indicated by the book's title, running is a key theme threaded throughout the memoir. The book is a moving testimonial to the healing power of running and is enough to make anyone want to lace up his or her shoes. As a runner myself, I was fascinated by the strategies the boys' coaches used and eagerly consumed the details of the twins' races. (Alie finished the 2013 New York City Marathon in 3:14:36!) But you don't need to be a runner to appreciate the role running played in the Schneiders' lives: in their twins' development or in their own parenting of two autistic children. For running is also a metaphor for the family's pursuit of happiness and a more socially-connected identity for the boys—desires that all parents have for themselves and for their children. They are desires that transcend barriers. Runners know that, in races, we are not our other identities, such as mother or writer. We are runners, silently embracing our common humanity side by side with those running with us. While Schneider's loving determination to give her sons a positive, productive life permeates each page of this book, this is no whitewashed account. Silent Running offers an honest and touching reflection on what it took for this family to thrive despite the strain the boys' learning and behavioral needs placed on their marriage, their friendships, and Schneider's own health. She isn't afraid to examine her own choices and regrets, and collaborated with an author committed to honoring the full truth of mothers' experiences. Helping women explore the complex realities of motherhood has been a tenet of Schneider's collaborator, Kate Hopper's, own work, including her book Use Your Words: A Writing Guide for Mothers and her own memoir Ready for Air: A Journey Through Premature Motherhood. And in Silent Running, Hopper has helped Schneider articulate her own complex needs for a meaningful life not only for her sons but for herself. As Schneider puts it, "Sometimes I wish I could go back to those early years and do them differently—take the time to nurture our marriage, to nurture myself. But it would be years before I would learn how to slow down and take care of myself." Some of the most poignant passages of the memoir come when Schneider faces her own health scare. When her boys were seventeen, she was diagnosed with breast cancer. She was confronted with every parent's worst fear: who would care for her children if she died? Alie and Jamie remained nonverbal into adulthood and continued to live with significant obsessive-compulsive behaviors and anxiety. As Schneider says, "My biggest fear . . . was that Allan and I would die before we could get the boys settled somewhere safe, somewhere they could be happy. What would happen to them when we weren't here to take care of them, to talk sweetly to them, to do all the loving things that parents do?" Schneider thoroughly researched breast cancer treatments, just as she had with her boys' autism treatments, and maintained the same positive attitude through her own radiation, chemotherapy, and Herceptin infusions. In turn, Allan read an article on the benefits of moderate exercise to breast cancer patients, and he made his wife promise to try running herself. And while she was undergoing chemotherapy treatments, she laced up her running shoes for the first time. "I listened to my footfalls on concrete," she writes, "and with each step, I felt myself running away from that cold leather chair and the IV bags of bright orange fluid. Instead I was running toward strength, toward wellness." Sometimes when we tell a stranger that Alie and Jamie have autism, it seems as though they stop seeing the boys as real people. They may glance at them out of curiosity, but they don't speak directly to them. They don't hold out their hand for them to shake. I know that sometimes people just don't know how to act around my sons; perhaps they're worried that they'll do or say the wrong thing. And certainly it's true that the boys are easily agitated. But I'm always grateful when we meet someone who seems to really see them. Connecting Schneider's challenges with her boys and her health to my own boys' challenges with food allergies and ADHD, and also my own health issues, including chronic digestive disease, I found Silent Running soothing and inspiring. As mothers, we can't control everything that happens to our children or ensure we'll always be there for them. These hard truths are unsettling. But like Schneider, we can navigate adversity with both strength and grace, running through difficult territory toward a series of happy finish lines. In this way, Silent Running felt like the voice of a trusted coach, inspiring readers to dig deep and to grow when being a parent feels like running uphill.